Exclusive discounts, packing lists, complete cost breakdowns & itineraries - along with helpful tips for a GREAT vacation! Take the kids on a weekend trip to New York City! Complete itinerary, packing list and cost breakdown are included, along with helpful links and addresses to help you get around. A helpful guide for parents who are excited to see their children experience the magic of NY. Available in digital or print. Travel to the mountains of Northern New Hampshire using this must-have guide that offers a complete cost breakdown, a packing list, and exclusive discounts. We share our experience and give you tips on where to go and what to do, along with coupons to save you money! Find discounts on accommodations, restaurants, snowmobiling, dog sledding adventures, safari tours, retail artisan gift shops and white water rafting! 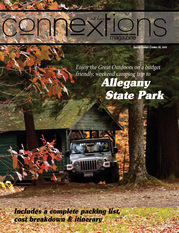 Download the Allegany State Park camping travel guide. Includes complete cost breakdown, packing list and itinerary, along with some camp fire recipes. Take it from someone who has been touring Allegany on an annual basis for over 20 years. A perfect guide to get the most out of your relaxed, unplugged weekend by the fire. Everything you didn't know you needed to know about traveling the Caribbean on a Carnival Cruise. Includes detailed pricing and a packing checklist, along with what to expect at several ports along the western caribbean. Every detail, down to the cost of sunscreen and cab ride back to the airport has been included. A imperative guide for first time cruisers. LGBT Friendly Travel Guide through Boston. Highlights include Quincy Market, Swank Properties, Revere Hotel Boston Common, Boston Harbor, The Freedom Trail, Ghost Tours, & more! A quick guide to get you excited and informed about your weekend in the walking city! PUERTO RICO IS THE PLACE! Travel to the island of Puerto Rico, the hidden gem of the Caribbean. Grab your must-have guide that offers a complete cost breakdown, itinerary and resources to plan your getaway. We share our experience and give you tips on where to go and what to do, along with tips to travel like a local! Whether it's the rainforest or the beach, ziplining or sun gazing - Puerto Rico is sure to please!